Erik joined Audubon in April 2011 as a Conservation Biologist for the Mississippi Flyway and Gulf Coast Initiative where he provided science-support and guidance for Audubon’s strategic planning process and building upon conservation and monitoring efforts in the region. 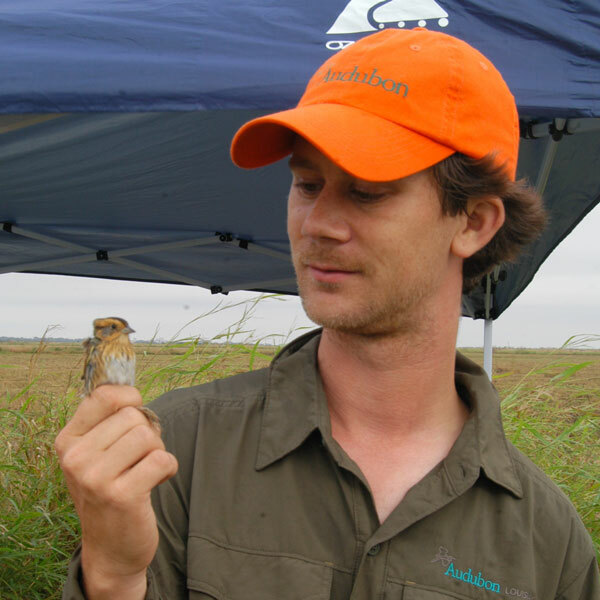 Before coming to Audubon, Erik’s graduate work at Louisiana State University included researching the effects of forest fragmentation on Amazonian bird communities and understanding the effects of fire management on grassland birds in pine savannas of the southeastern U.S., and he has published his work in scientific journals including The Auk and Ecology. It was while finishing his dissertation when the BP oil spill shocked the Gulf Coast and in response, Erik helped develop a citizen science program across the central Gulf Coast, Audubon’s Coastal Bird Survey, which he continues to lead. Erik started his ornithological career stewarding and monitoring breeding Least Terns and Piping Plovers in Massachusetts, and has returned to these coastal roots by leading the development of a comprehensive beach-nesting bird stewardship program in Louisiana by developing partnerships with other organizations and local communities. Erik also has developed several bird monitoring initiatives at the Paul J. Rainey Audubon Sanctuary to understand the effects of management on marshbirds, supporting the science-based restoration mission of the Rainey Conservation Alliance, a collaboration among local landowners in Vermilion Parish to save coastal marshes. Erik is active in Louisiana’s birding community and serves as Louisiana’s Christmas Bird Count regional editor, a member of Louisiana’s Bird Records Committee, Vice President of Baton Rouge Audubon Society, and Co-director of the Louisiana Bird Observatory. Johson, E.I. and J.D. Wolfe. (in press). Molt and aging guide to Central Amazonian and Neotropical birds. Studies in Avian Biology. Remsen, J.V., B.P. Wallace, M.A. Seymour, D.A. O’Malley, E.I. Johnson. (in review). The regional, national, and international importance of Louisiana’s coastal avifauna. The Wilson Journal of Ornithology. Johnson, E.I., J.D. Wolfe, M. LaSalle. (in review). An independent assessment of the frequency and extent of oiling on birds during the Deepwater Horizon oil spill: utilizing citizen science to understand broad patterns. Waterbirds. Karmacharya, B., E.I. Johnson, J. Hostetler, J.D. Wolfe, S.M. Duke-Sylvester. Population dynamics of Northern Cardinal and Carolina Wren in an urban forest fragment: Safe refuge or ecological trap? In prep. Powell, L.L., J.D. Wolfe, E.I. Johnson, and P.C. Stouffer. (2016). Forest recovery in post-pasture Amazonia: Testing a conceptual model of space use by insectivorous understory birds. Biological Conservation. Johson, E.I. (2015). Geographic variation in the extent of the preformative molt in American Goldfinches. North American Bird Bander. Powell, L.L., J.D. Wolfe, E.I. Johnson, J.E. Hines, J.D. Nichols, and P.C. Stouffer. (2015). Heterogeneous movement of insectivorous Amazonian birds through primary and secondary forest: A case study using multistate models with radiotelemetry data. The Wilson Journal of Ornithology. Powell, L.L., G. Zurita, J.D. Wolfe, E.I. Johnson, and P.C. Stouffer. (2015). Changes in habitat use at rain forest edges through succession: a case study of understory birds in the Brazilian Amazon. Biotropica. Wolfe, J.D. and E.I. Johnson. (2015). Geolocator reveals migratory and winter movements of a Prothonotary Warbler. Journal of Field Ornithology. Johnson, E.I. and J.D. Wolfe. (2014). Thamnophilidae (antbird) molt strategies in a central Amazonian rainforest. The Wilson Journal of Ornithology. Wolfe, J.D., E.I. Johnson, and R.S. Terrill. (2014). Searching for consensus in molt terminology 11 years after Howell et al.’s “first basic problem”. Auk. Stouffer, P.C., E.I. Johnson, and R.O. Bierregaard Jr. (2013). Breeding seasonality in central Amazonian rainforest birds. Auk. Powell, L.L., P.C. Stouffer, E.I. Johnson. (2013). Recovery of understory bird movement across the interface of primary and secondary Amazon rainforest. Auk. Johnson, E.I., J.D. Wolfe, D. Mooney. (2013). An eccentric preformative molt in Eastern Towhees. North American Bird Bander. Wolfe, J.D., E.I. Johnson, P.C. Stouffer, F. Owens, E.E. DeLeon, E.R. Liffmann, K.E. Brzeski, S. Utley, D. Mooney, C. Coco, G. Grandy. (2013). Annual survival of birds captured in a habitat island bordered by the urban matrix of Baton Rouge, LA. Southeastern Naturalist. Johnson, E.I., P.C. Stouffer, and R.O. Bierregaard Jr. (2012). The phenology of molting, breeding and their overlap in central Amazonian birds. Journal of Avian Biology. Wolfe, J.D., T.B. Ryder, P. Pyle, E.I. Johnson. (2012). Using molt and plumage cycles to age tropical birds: Updates and recent advances. Ornitologia Neotropical. Wolfe, J.D., E.I. Johnson, E.R. Liffmann, E.E. DeLeon, K. Mokross, K.E. Brzeski. (2012). Brown Thrasher (Toxostoma rufum) with dill deformity captured at Blubonnet Swamp Nature Center, Baton Rouge, Louisiana. Journal of Louisiana Ornithology. Johnson, E.I., J.D. Wolfe, T.B. Ryder, P. Pyle. (2011). Modifications to a molt-based ageing system proposed by Wolfe et al. (2010). Journal of Field Ornithology. Stouffer, P.C., K.L. Cockle, A. Aleixo, J.I. Areta, J.M. Barnett, A. Bodrati, C.D. Cadena, A.S. Di Giacomo, S.K. Herzog, P. Hosner, E.I. Johnson, L.N. Naka, C. Sanchez. (2011). No evidence for widespread bird declines in protected South American forests. Climate Change. Johnson, E.I., J.K Dimiceli, P.C. Stouffer, M.E. Brooks. (2011). Habitat use does not reflect habitat quality for Henslow’s Sparrows (Ammodramus henslowii) wintering in fire-managed longleaf pine savannas. Auk. Stouffer, P.C., E.I. Johnson, R.O. Bierregaard Jr., T.E. Lovejoy. (2011). Understory bird communities in Amazonian rainforest fragments: Species turnover through 25 years post-isolation in recovering landscapes. PLoS ONE. Johnson, E.I. (2011). Fragmentation sensitivity and its consequences on demography and host-ectoparasite dynamics in Amazonian birds. Dissertation LSU. Uriarte, M., M. Anciaes, M.T.B. Da Silva, P. Rubim, E.I. Johnson, E.M. Bruna. (2011). Disentangling the drivers of reduced long-distance seed dispersal by birds in an experimentally fragmented landscape. Ecology. Johnson, E.I., P.C. Stouffer, C.F. Vargas. (2011). Diversity, biomass, and trophic structure of a central Amazonian rainforest bird community. Revista Brasileira de Ornitologia. Johnson, E.I., J.D. Wolfe, J.E. Hartgerink. (2011). Barred Owl consumes Sharp-shinned Hawk. Journal of Louisiana Ornithology. Johnson, E.I., C.F. Vargas, T.V.V. Costa, C.B. Andretti. (2010). A range extension and ecology of Boat-billed Tody-Tyrant Hemitriccus josephinae in central Amazonian Brazil. Bulletin of the British Ornithological Club. Johnson, E.I., J.K. DiMiceli, P.C. Stouffer. (2009). Timing of migration and patterns of winter settlement by Henslow’s Sparrows. Condor. DiMiceli, J.K., P.C. Stouffer, E.I. Johnson, C. Leonardi, E.B. Moser. (2007). Seed preferences of wintering Henslow’s Sparrows. Condor. Johnson, E.I. (2006). Effects of fire on habitat associations, abundance, and survival of wintering Henslow’s Sparrows (Ammodramus henslowii) in southeastern Louisiana longleaf pine savannas. Thesis LSU. Wolfe, J.D., E.I. Johnson. (2011). Louisiana’s crude awakening: how citizen scientists help monitor the effects of oil on birds. Birding.